I may have been off by about five points in terms of point differential, but I pretty much nailed last week’s game prediction. The Jags simply look like the team to beat in the AFC right now, and I am not surprised at all that Brady & Co. took an L down in the Sunshine State in Week 2. Fortunately, the Pats have a good chance at a bounce-back game in a prime-time matchup against old friend Matt Patricia and the 0-2 Detroit Lions this Sunday – which also just so happens to be the date on which ya boy Mattes graced the world with his presence 29 years ago, so it’s only right that they’ll be victorious on such an important day. As you can see from the 51.5-point total, which is the fourth-highest total in the league this week, this game figures to be high-scoring. Both teams have a potent offense which overcompensates for a mediocre defense that is susceptible to giving up a lot of yards and points. Basically, if you got fantasy players on either side this week, feel free to go ahead and put pretty much all of them in your starting lineup. So, who are some of the weapons that Detroit has? Well, they’re found mostly in the receiving corps, and their success all hinges upon the play of much-maligned quarterback Matthew Stafford. After an abysmal Week 1 performance, during which he threw FOUR picks in a loss to the New York Jets, people were calling for Stafford’s head (including our very own Red, who has him as his fantasy signal-caller this year). However, I thought it was a bit much. For as much as he turned the ball over during his first few years in the league (four seasons with 15-plus interceptions), he has an 89:37 TD-to-INT ratio over the past four seasons, which includes 2018. He’s also one of only five players to ever throw for over 5,000 yards in a season, and I bet you didn’t know that he was the fastest quarterback ever to reach 20,000 yards, 25,000 yards, AND 30,000 yards on his career. The guy’s also coming off of a 347-yard, three-touchdown, zero-pick performance against San Francisco. The point is: this dude can sling the rock, and the only reason he gets so much criticism is because he’s yet to win one playoff game in 11 NFL seasons. (I get it, Detroit; you’re hungry.) And with Detroit’s nasty group of receivers, coupled with the fact that the Pats have given up the fifth-most passing yards in the league through two games, Stafford could do some damage on Sunday. Of the receivers, I expect Golden Tate to have the most success. The game’s most underappreciated slot receiver has 14 catches on a ridiculous 28 targets through two games so far as Stafford’s No. 1 guy. The Lions also have two big boys on the outside in Marvin Jones (6’2″, 198 pounds) and Kenny Golloday (6’4″, 214 pounds), both of whom use their size and unfair athleticism to gain big chunks of yards in a hurry, averaging 13.5 and 15.6 yards per catch, respectively. The Pats are definitely going to give up some real estate through the air this week – especially if either Trey Flowers and/or Patrick Chung, who both haven’t practiced this week due to being in concussion protocol, are ruled out. Sure, I’m excited about Gordon. But MAN, I really wish those Golden Tate trade rumors weren’t just all talk. This dude can BALL. Fortunately, they could have success containing Detroit’s very lackluster running game. Right now, the team is using a three-pronged “attack” of Kerryon Johnson, Theo Riddick, and former Patriot LeGarrette Blount. Riddick has been one of the Lions’ key offensive pieces for the past five seasons as the team’s third-down/pass-catching specialist. While he is not built to be any team’s primary ball-carrier, he does have 234 (!) receptions since 2014, including 14 already this season. He’s going to be targeted and used a lot. Johnson, a rookie, is by far the most talented back of the bunch from an overall standpoint, but for some reason he has been sharing the load with Blount between the tackles so far. Truthfully, Johnson – who also has eight receptions on the year and is by no means a one-trick pony – should have been given the starting role right out of the gate, and maybe this is the game he finally takes a stranglehold on the role for good. It’s only a matter of time until Blount fades away entirely. Either way, I don’t expect the Lions to kill the Pats on the ground. 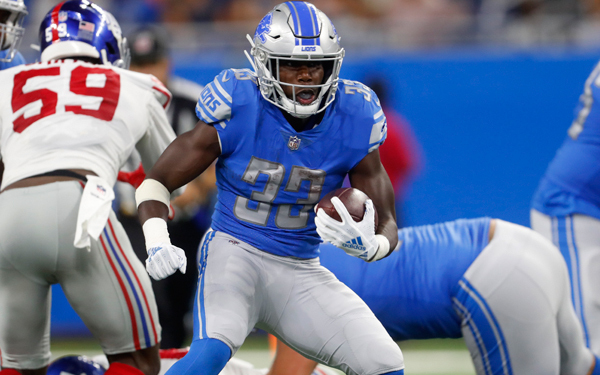 Johnson will be a household name soon enough, giving the Lions their first good back since Barry Sanders – and Mattes’s fantasy squad a much-needed boost. (What Will We See from Josh Gordon? ): This is obviously the biggest storyline heading into the game. Pats Nation is absolutely giddy with excitement over this week’s acquisition of the uber-talented but oft-troubled 27-year-old receiver. He has the skills to make a Randy-Moss-level impact on the team’s offense, or he could easily succumb to past transgressions and fade out in a “Flash.” I’m remaining hopeful, but I’m also not expecting a huge impact from him in Game 1. As we’ve discussed before, the Patriots system has claimed the careers of many former standout pass-catchers in the past, and while Gordon has practiced the past two days, he’s going to need a little more time to get up to speed. He’s also dealing with a minor hamstring issue, so don’t expect him to be truly unleashed until at least next week. If Bill does decide to throw him right into the fire, though, I’d say 4-5 targets, max, isn’t an unreasonable expectation. Apparently, Flash is going to be rocking No. 10 as a Patriot. (Reunited and It Feels So Goooood): For the 21st time in his Patriots career, Belichick will face off against one of his former assistants, against whom he has a combined 14-6 record. This time it’s former defensive coordinator Matt Patricia, who’s currently suffering through a tough start to his NFL head-coaching career. There’s really not much to be said here, as it’s really only a fluffy storyline being used to try and create some more drama and intrigue. Still, it’s always fun to see if the grasshopper can successfully take down the master…even though he probably won’t. Always remember the good times, boys. The Pats are able to come out and establish the run early on. Detroit’s defense has been absolutely GASHED so far on the ground, giving up 179.5 rushing yards per game, which is good for dead last in the league. (I know it’s only been two games, but the next-worst mark is Oakland with 154. The Lions run D is horrendous.) Brady is also able to move the ball pretty well through the air and puts up over 20 points before the half. Not to be outdone, Stafford also has his way with the Pats defense, but the Pats clock-killing offensive game plan doesn’t give him a ton of opportunities to keep up. In the end, the game will be close and high-scoring, but the Pats will ultimately tame the Lions, 38-28. This entry was posted in NFL, Patriots and tagged Bill Belichick, Detroit Lions, Golden Tate, James White, Josh Gordon, Kenny Golloday, Lions, Marvin Jones, Matt Patricia, Matthew Stafford, New England Patriots, NFL, NFL Week 3, NFL Week 3 Matchups, NFL Week 3 Preview, Patriots, Rex Burkhead, Sony Michel, Sunday Night Football, Tom Brady, Week 3. Bookmark the permalink.